I’m a white person. I grew up in the UK in a white community. Every single person who went to my local church was white. This was because they all lived in the area. Every single person who lived in the area was white. The area was predominantly Roman Catholic because in the history of Northern Ireland there was a certain practice over hundreds of years for people to remain segregated in living areas based on their religion. This has happened in spite of Scripture with all parties claiming to be Christians. When I moved to London in 1988 I started to attend the local Catholic church in East London. There were a few black people in this congregation. Some Sundays the priest would be a black man. There were black altar boys on the altar. It seems strange now in hindsight but I understand that I was never introduced to anyone from the congregation other than white people. I never had any fellowship or conversations with anyone at the church when I attended. I was not a committed member of the congregation but I did attend their Social Club on Saturday nights to drink beer and sing along with Irish songs, and it never struck me as odd that there was only one black man in attendance. He sat on his own at the table beside the bar with his own pint of Guinness quietly and I seem to remember him speaking to me but I never engaged in conversation. It did not appear that any of the other people that were attending these community centre events were talking to him either. He seemed to be a loner. There was one Indian couple at these events also. Most of the people were white people. I never saw any of the black or asian members of the congregation in the homes of my relatives who attended that congregation. I was not aware of any friendships that my family had outside of the white people from their church that visited their home and interacted with them at the social club. The area that they were living in had a very mixed population and there were Catholics from all different backgrounds attending the church. There simply were no non-white relationships formed of any significance that were visible to me as a child or young person being around my family in London. When I started to seek religious experiences I did so at the invitation of my aunt who was going to the church and the group that she invited me to attend was also entirely white in it’s demographic. There was one lady who had long curly hair whose mother I think, was Spanish. The entire group were Caucasian. I attended small group meetings composed entirely of white people. I also attended larger conference type meetings which I remember as being almost entirely composed of white people as well. This was my experience of my religion in London in 1988/9. This basically amounts to white segregation. London’s predominantly white worship groups are just as ethnocentric as it’s all black or all Asian ethnocentric groups. 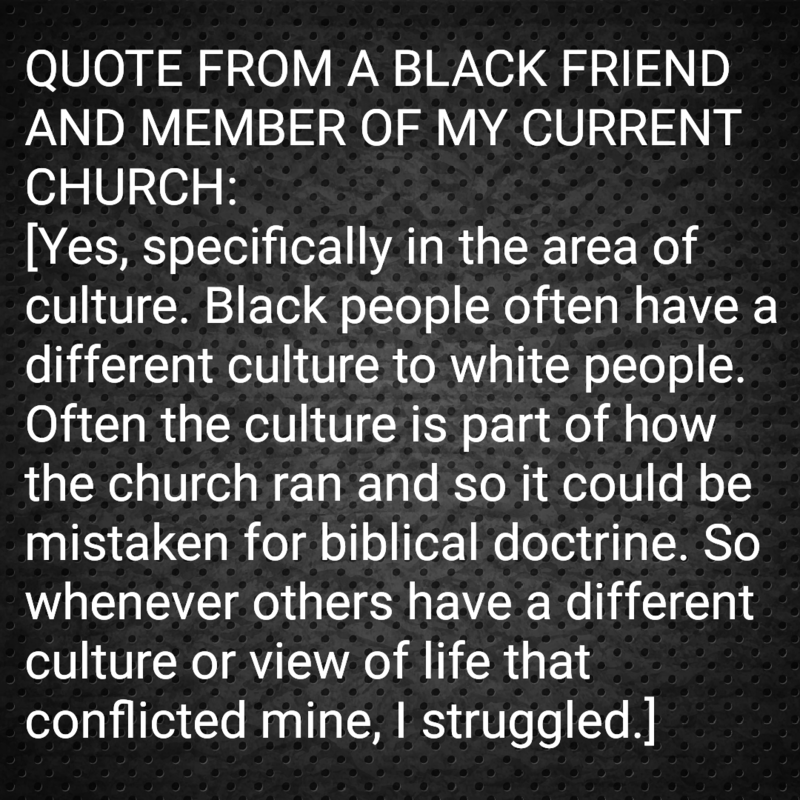 It is highly questionable thinking to disregard predominantly white churches as ethnocentric (2 Corinthians 5:16). Worshipping God through white coloured spectacles reinforced my choices to have all white friends and roommates at University. The Catholic church does not actively practice segregating the ethnic groups within its membership in London. It is simply that the white people I knew were more comfortable being with white people at church AND at University. 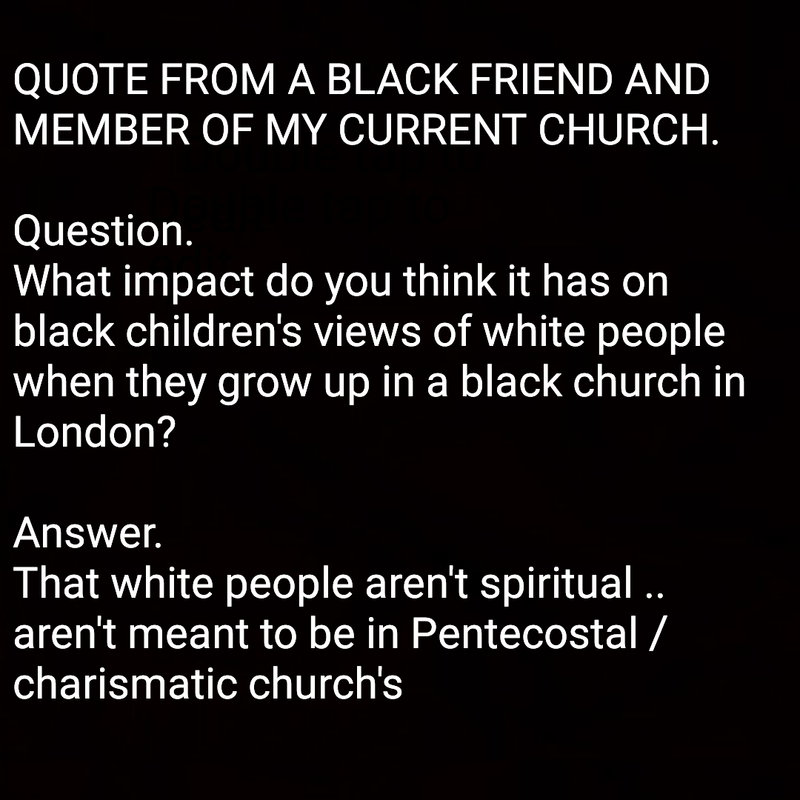 They did not have a conviction to have black friends or introduce me as a young Catholic in London to black people. 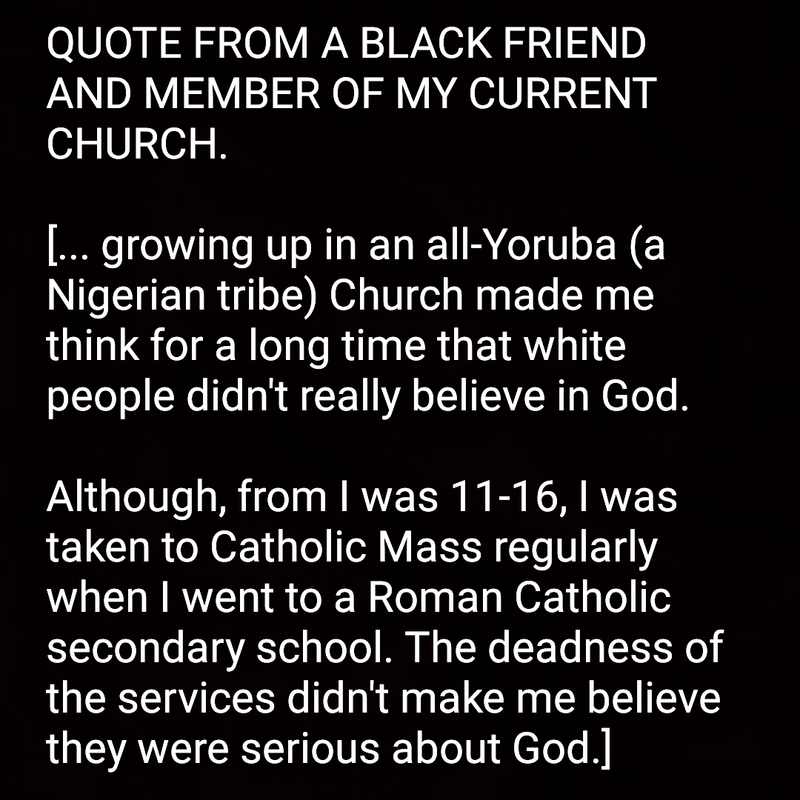 I never made black friends as a result through the church. The only time I came anywhere close to this was on a soup run into central London in 1990 with the Sisters of Charity, Mother Theresa’s nuns. The nuns were entirely focussed on saying the rosary though and didn’t talk to me at all on the way or way back. My own identity was reinforced by this subconscious segregation so that even at university I didn’t feel comfortable to sit with and talk to black students. I was socially backward. It was not until I met a Nigerian man at my University who befriended me and taught me the Bible that I was able to see that it was possible for me to even be friends with black people. That’s awkward to admit even 26 years later. The question comes, ‘How is the church any different from the world’? I drove through Shoreditch on a Saturday night a couple of years ago. I was shocked to see that most of the people socialising in that area, coming out of clubs, pubs and wine bars where white people. It appears that the whole area is a stomping ground for white people that like to socialise with white people. It was a shock for me because I’ve not been to bars like that for over two decades. I understand if a black person wants to go to clubs that are mostly full of black people, they might go to the Peckham area and find that they can socialise with people much like themselves, if they choose to do so. I also understand that if you go to the Soho area you will probably find very mixed clubs, wine bars, pubs and restaurants. So you can have it your own way in London! When I was a student just over a year ago I also noticed that the majority of the class were sitting with their own kind of people. Most of the African girls are sitting together in the front four rows, most of the homosexuals were sitting together, most of the pretty white girls were sitting together, most of the Irish girls were sitting together etcetera etcetera. We were being taught anti discriminatory practice and yet most people were chosing to have segregated seating. This doesn’t say much for the practice that these particular people will demonstrate in their professional life. In my experience Londoners are still very segregated. The churches are still very like the world. When I moved into my street 5 years ago there were no less than 7 African churches on my street and a mosque full of black Muslims and then just round the corner literally on the next street a mosque where the Asian Muslims worship was built. I had up until this point been ignorant of the racial segregation in London’s Islamic community. Just last week I had a text from an Asian man counter-inviting me to his church which was almost entirely members of one Asian nation and this group is meeting in London. I checked their website and saw lots of pictures mostly of his country people. There are several such examples of ethnocentric Asian and Chinese churches in London. I guess for a white person in the UK and especially living in London writing an article about ethnocentric religion (especially this one) i better first of all get a politically correct disclaimer stuff out of the way before I launch into what could be misconstrued as a racist rant. First of all I just wanted to be understood that I do value family. I came from a broken home. My father was an alcoholic. My parents separated when I was 11 and divorced when I was 21. I was raised by my mother during my teenage years as a single parent. I value family. I value the great amazing family that I have found in the International Church of Christ from 1990 to 2003 and also the amazing family that I continue to have in the International Christian Church from 2005 through to today. I have a great many spiritual brothers and sisters and uncles and aunts, fathers, mothers and even some grandparents in the church. Family is probably one of the most important things to me. So when I talk about family based religions in a negative way please understand that I’m not speaking against family as such because I understand that God has set up society in families. And next up I want to talk more about white people. I’m not a big fan of white people. I’m Irish. I did my first equal opportunities course in London in 1989. I drew myself on the ethnic diagram as a white man but during the session I found out that I was politically black and so I changed myself on the class diagram from white to black. My classmates laughed. However I was perturbed by the apparent contradiction. What has stuck with me ever since is that this kind of discussion is actually never black or white! When I think about white people I think about people who continued to develop the African slave trade from the 1600s after the Muslims got it started in the 700s. I think about dry dying religion. 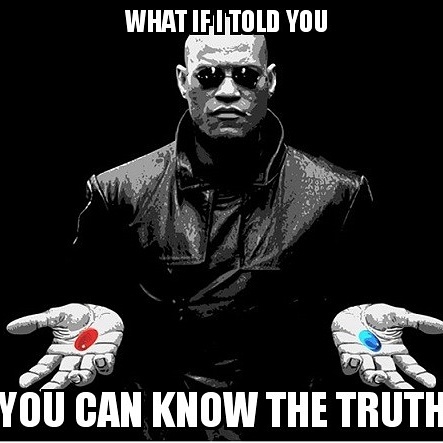 I think about Freemasons and generally people who cause trouble in the world through wars and technology and that kind of stuff. I think about a man who sustains his wealth on the backs of the poor. I don’t feel solely responsible for all this as a white person but I have a sense that the balance needs to be addressed through my life, with my skills, if at all possible, as much as possible before I die. So if I say anything negative about black people please try to see it in that light. 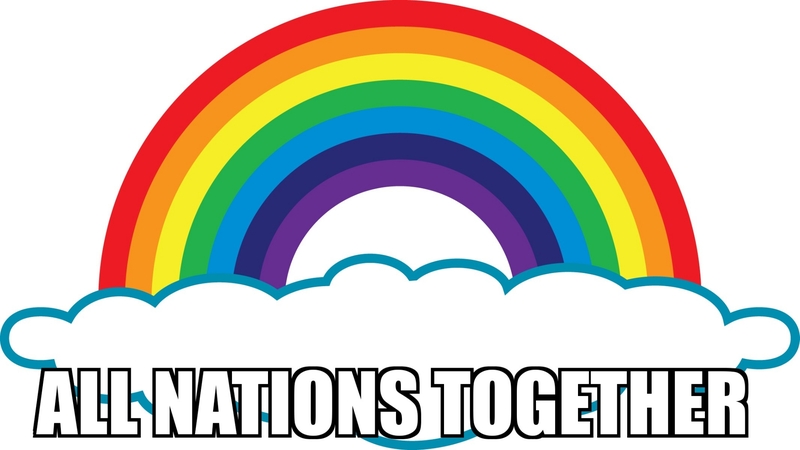 I was an armchair nationalist for some years. I grew up in a nation and community soaked in propaganda and political oppression. You could often cut the atmosphere with a knife. I was led to believe my community members had the right to kill people under certain circumstances. I began to feel that was the right world view. One man’s terrorist was my freedom fighter. Many children in my community took on the world view of our faith community. The world is filled with nations and they are filled with nationalists who are essential separatists for a variety of reasons. Multiculturalism in the UK has funded nationalists for decades to promote their brand to their people. I was a victim of this in 1989 when I was convinced by outside politically motivated individuals to set up an Irish society in my university that excluded Irish protestants by its sectarian constitution. So sad. 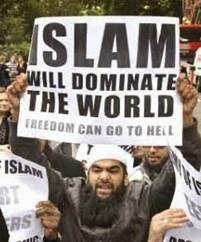 Multiculturalism sets each of the metaphorical human body parts up as a seperate superior part of the ‘human’ body. Jesus wanted NOTHING to do with this. John 6:15 Jesus, knowing that they intended to come and make him king by force, withdrew again to a mountain by himself. Jesus didn’t want a national body. He want one unified body for the human race transcending nationality, race and politics. I have met a significant number of people who are members of churches predominantly of one race who try to claim that Jesus body is made up of all the ethnocentric churches put together and that he loves them all with all their idiosyncratic and divisive traditions, their disobedience to unity commands and teaching on humility and self denial. But tradition that goes against the bible cancels out the merit of great commitment and worshipfulness. Romans 10:12 For there is no difference between Jew and Gentile—the same Lord is Lord of all and richly blesses all who call on him, (Colossians 3:11). Many Jews could not embrace the New Covenant. They became too comfortable among their own people. Even after they became Christians they struggled with racism (Galatians 2:11-13). The world is just a collection of ethnocentric nations. Ethnocentric churches in the UK are in fact just part of the world. 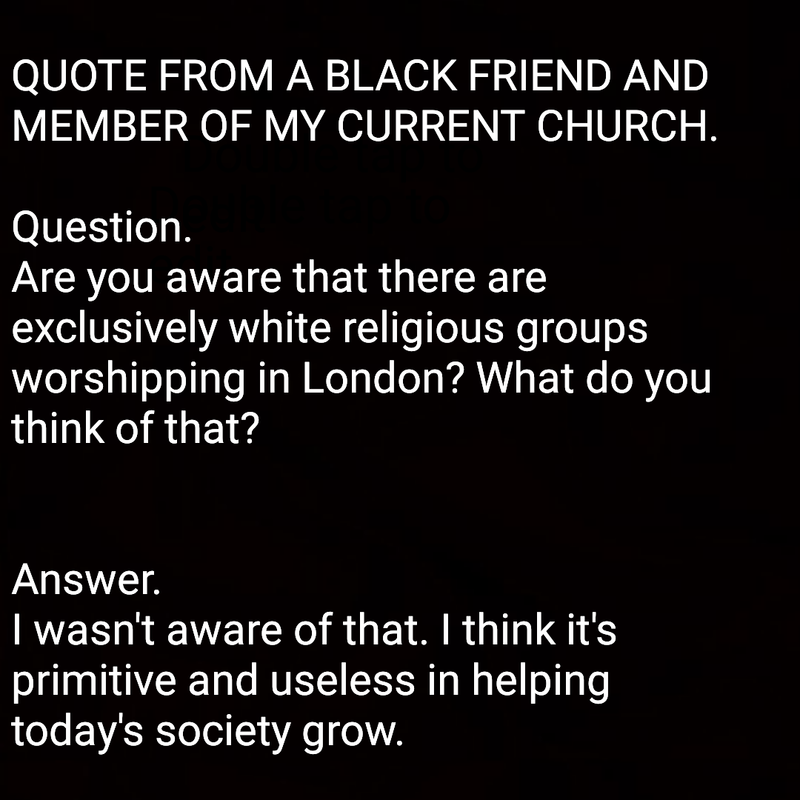 The non-white churches are a stumbling block to winning the radical white Englishmen we need to convert who will help win this nation to Christ. 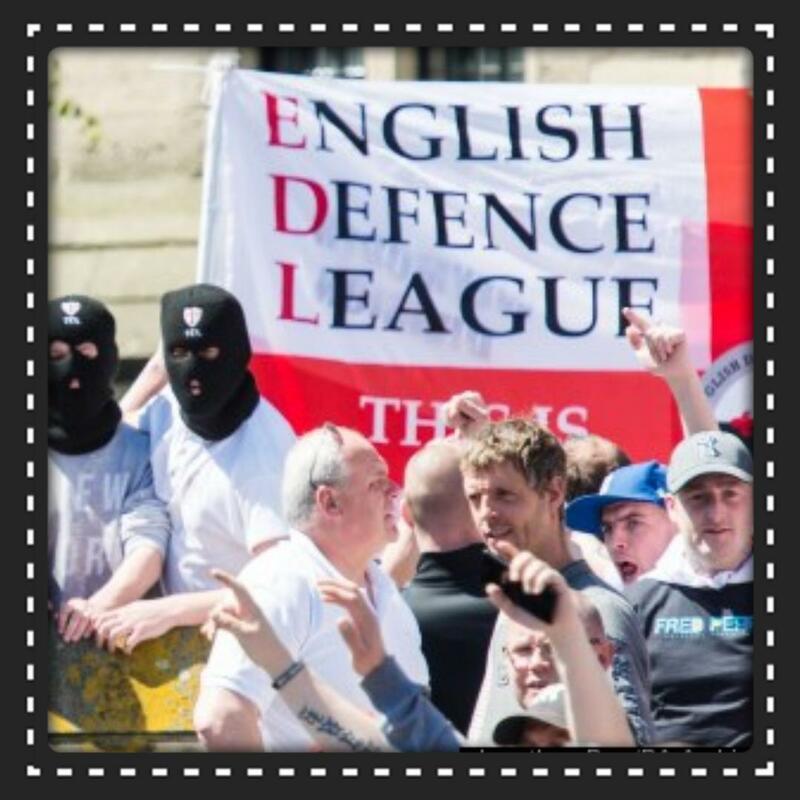 Imagine if the English Defense League were disciples. Imagine hundreds of brave, fearless, white English men ready to die for Jesus. Men on the front line willing to challenge government, corrupt police and radical Islam and in a mixed London church. How do these white people feel about large groups of black people doing their own ethnocentric thing in the UK? 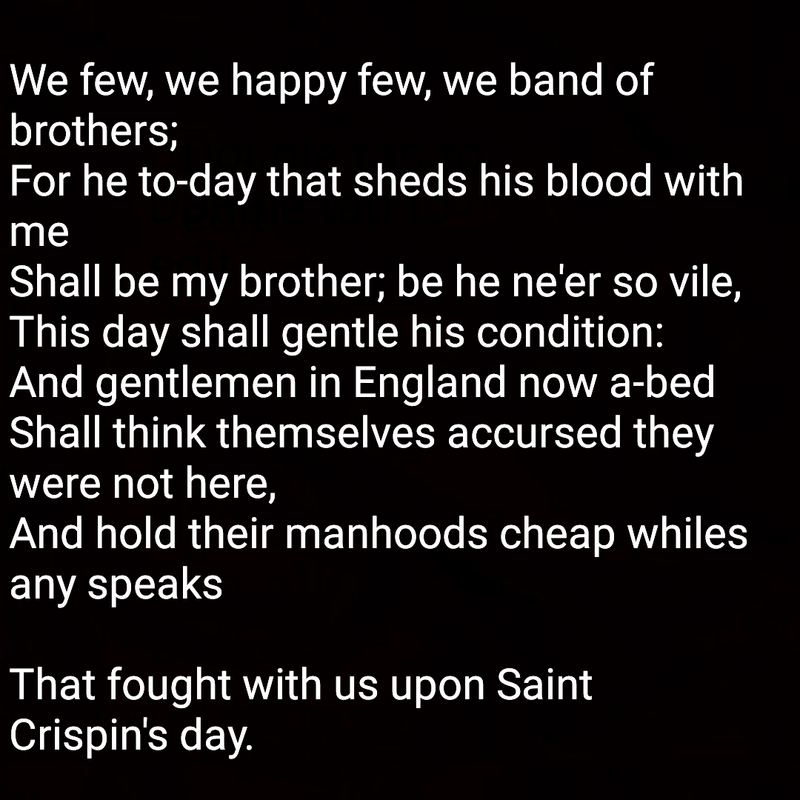 If these same Englishmen were disciples in the spiritual battle of Britain they would have the heart of Henry the fifth toward all their ‘other’ brothers. I have seen this. I have heard this. Jesus has the answers to England’s problems. I’ve seen Officers of the Northern Ireland bomb squad confessing sin side by side with Republicans, I’ve seen the class and race war resolved in the church. I share my faith with a lot of white folks. They do present certain challenges but these are not by any means insurmountable. I was evangelised by a Nigerian man. My wife who is a British white woman was evangelised by a Nigerian woman a year after me in a different UK city. I am grateful for the perseverance of both these black Christians who had the faith to do that hard work. I wish more black Christians had their faith. Can you imagine what people like Louis Farakan would achieve if he would open his ranks to whites and radicalism them into black power activists?! The church cannot be like the world. We should be outraged by ethnocentric religion in our city. We should strive to reach out to the ‘others’ all around us. Each culture has strengths that should be shared. Jesus Himself commanded that we love like He did (John 13:34-35). He was an entirely different species to us, being God, yet he came among us and we regarded Him as a man. He brought us the culture of His species. He taught us to regard any divisive tradition as being human faeces (Philippians 3:8). Therefore as a disciple of Jesus I cannot be sentimental about my religious white people. Just because I understand their perspective I cannot in ANY way justify their disobedience. Ethnocentric religion is an abomination to the God of the bible. My white church people need to repent! Ephesians 2:19 Consequently, you are no longer foreigners and aliens, but fellow citizens with God’s people and members of God’s household. I treasure the mix of races obvious among my church’s membership. There are a significant number of whites among brothers and sisters from numerous diverse African nations. This is our strong belief. We are not believers in ethnocentric religion. Therefore I invite ALL my friends often. I am proud to say, I can promise anyone that they will not be disappointed. Please come and see God at work among us.